I really don't know what to say about the Dodge Journey SXT, not so much because of the vehicle itself but because of the position Chrysler finds itself in. In case you live on another planet, Chrysler is now owned by Fiat. Who knows if this ownership will stick? It's crazy out there in autoworld. 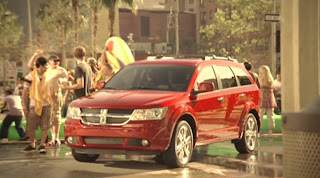 The Dodge Journey is, well there's no other way to say this, it's a perfectly so-so truck. I couldn't find anything to complain about - it seemed well-built - but I couldn't find anything to rave about either. The SXT I drove, a FWD only model (AWD is available) is rated at 16-mpg city and 23-mpg highway, not great but not bad. Keeping up with traffic I only saw 19-highway. The 3.5-liter makes 235-hp, which should motivate the Journey very well but at 4,200 lbs., there's a lot of Journey to motivate. There is a 2.4-liter four-cylinder - I shudder to think about its acceleration potential. Dodge uses a 6-speed automatic transmission that worked flawlessly. The SXT will seat seven - I had six in it and it wasn't too difficult to get in or out of. Dodge has some cool built in booster seats for your kids - the seat cushion of the middle row of seats swings up a few inches so the tykes can have a commanding view. The Journey SXT starts at $23,125; the version I drove broke $30,000. I have no idea if Chrysler will survive; I definitely hope so.